The backdrop of CND’s 60 years of history is in the story of its relations with the Labour Party and with the left in Britain, both full of contradictions. Kate Hudson has long been steeped in CND history, as its general secretary for a decade and for seven years before that as its chair. In this book she has done a great job with the archives to give a vivid feel for the years in the shadow of the cold war and Britain’s umbilical link to US foreign policy. The compromises, splits, betrayals and principles heroically upheld within CND and its splinter movements were intertwined with intellectual and personal power struggles in the Labour Party. In the world of social media today, such political fights are mostly on public view, but this book tells a story known in detail to relatively few beyond the participants, most of whom are no longer with us. Here is the campaign’s start in 1958 behind the eloquent intellectual and moral leadership of Bertrand Russell, JB Priestley, Donald Soper, Kingsley Martin, Rose Macaulay, Julian Huxley, Canon John Collins and Michael Foot. A mass movement for Britain’s unilateral nuclear disarmament, speaking to the public’s outrage after the horror of Hiroshima and Nagasaki and huge anxiety at nuclear testing and the effect of Strontium-90, was born from their writing. CND’s story is one of waxing and waning tides of public opinion’s engagement with the urgency of the threat of nuclear weapons. Its strength through the decades has depended partly on resistance to the extent of successive British governments’ commitment to spending on nuclear weapons and acceptance of US nuclear warplanes and bombs being based in Britain. But also crucial has been its evolving links to general anti-war campaigns, notably in the years of Vietnam in the 1960s and then in the 1990s and thereafter, against the devastating Western wars of choice in Iraq, Afghanistan, Libya, Syria and Yemen. The book records the ebullience of the four-day Aldermaston Easter marches, where 8,000 people in 1958 had become 100,000 by 1960. By 1962, with the acute cold war nuclear crises over Berlin and then the Bay of Pigs in Cuba, there were 1 million US soldiers in 200 foreign bases threatening the USSR. The Partial Test Ban Treaty of the following year seemed for a moment to mark a breathing space from tension although, in fact, only the US, Britain and the USSR signed it. 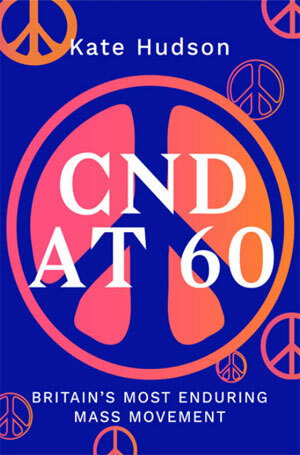 CND was impossible to ignore, with public events like the iconic Trafalgar Square Easter rally of 1966 under the wing of a ‘Punch and Judas’ extravaganza. There were 20-foot puppets designed by great satirical cartoonist Gerald Scarfe and a ‘bold, shameless, satirical script’ featuring Britain’s prime minister Harold Wilson, Ian Smith, of white Rhodesia’s independence movement, US president Lyndon Johnson and the Bank of England. Thousands of helium balloons carried silver-foil missiles and bombs and, to the sound of missiles, buckets of blood-red paint were thrown in the faces of the rogues’ gallery of war criminals, while Harold Wilson’s head split open and a crying baby emerged. It was then set on fire as the roar of B-52 bombers filled the air. Those were the years of the Vietnam war and these protests linked the US war in Asia with Polaris nuclear missiles in Britain and the wider Labour Party leadership's failure of principle. In 1968, the Nuclear Non-Proliferation Treaty (NNPT) was passed at the UN with 95 votes for and 21 abstentions, but disarmament was soon an evident failure. Polaris was replaced by Trident and the US planned to deploy neutron bombs with their advanced potential to damage people more than buildings in Europe. There was pressure on the continent in which END (European Nuclear Disarmament), an ally of CND, had a key role, as did the outstanding brave and determined Greenham Common women’s peace camp. The neutron bomb initiative was pushed back. But today there are still 200 US nuclear weapons in Western Europe and Turkey — illegal under the 1968 NNPT — and in Britain we have a government determined to press ahead with the upgrade of Trident against all logic and overwhelming public opposition. But Britain, like the other nuclear states, is going against the curve of history. Last year, the 2017 Nobel Peace prize was awarded to the International Campaign to Abolish Nuclear Weapons, a coalition of hundreds of organisations, including CND, which was among its founders. And last summer 122 countries at the UN endorsed a global treaty to ban nuclear bombs, despite strong opposition from nuclear-armed states and their allies. The US and North Korea terrorising the world with their nuclear threats earlier this year will no doubt be another moment when CND has a surge of new support to mobilise against the grotesque global threat which our leaders still refuse to recognise all these decades after the US war crimes at Hiroshima and Nagasaki.